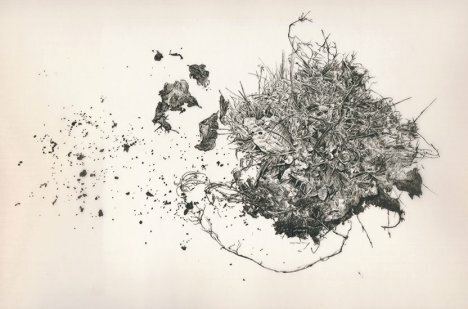 The exhibition, “Conflicted Memory” at Alan Cristea gallery, London, from 29 April – 1 June 2013, shows the work of eight international artists, all women looking at memories, personal narrative, and history of conflict. Each artist has personal experience of conflict and socio-political change, and the work they make attempts to engage with that past while encouraging debate about effects of such a history. de Burca uses detailed drawings and a short film to consider the “legacy of conflict tied to particular places”. In the work for “Conflicted Memory” she refers directly to Crom Estate which separates the two sides of Belfast, where she lived for a time. Using precise drawings of textbook pages that are then erased away, Goddard reflects on memories from teenage years at a time when apartheid was coming to an end in South Africa. A particularly sharp moment was when all the school textbooks were replaced and she discovered what’s written is not necessarily the “real” history of a place and time. 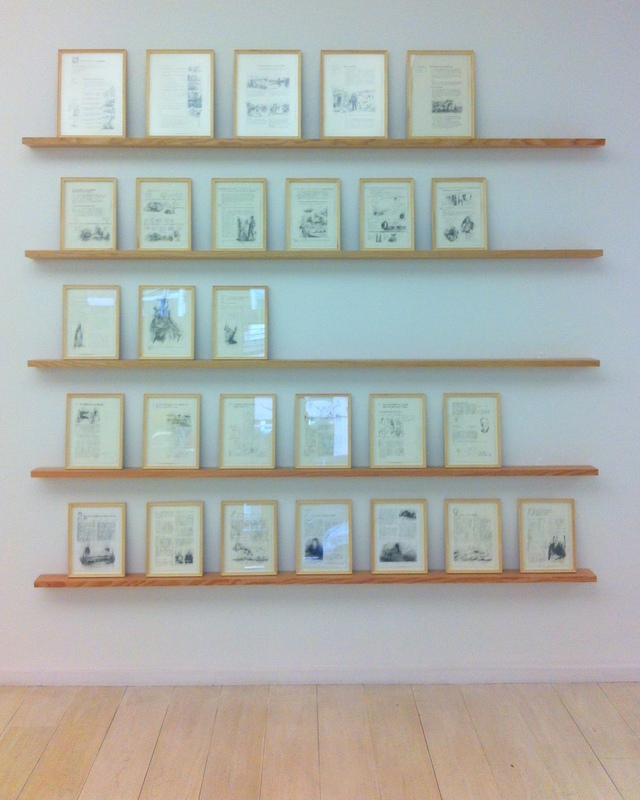 Ruth Goddard, ‘A persistent history’, 2011-12, graphite on paper, in ‘Conflicted Memory’ at Alan Cristea gallery, London. Image courtesy Kelise Franclemont and Alan Cristea gallery. Jusic recalls the Bosnian-Serbian conflict, a memory which is extremely personal and intimate. 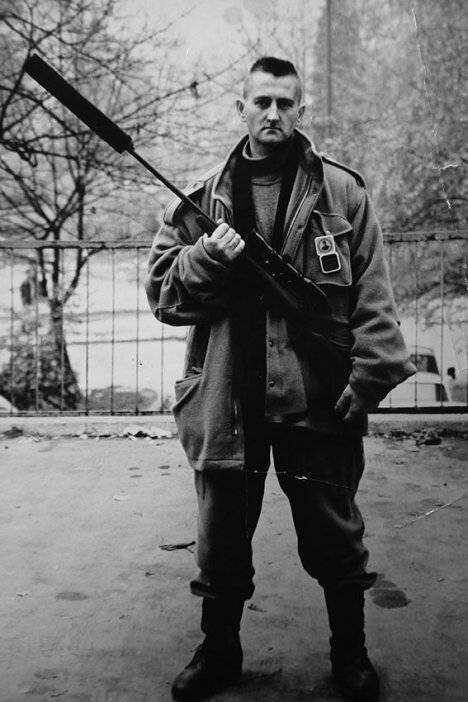 In her short film, “The Sniper” (2007), we hear Jusic’s voice recounting the record of kills by her sniper father, as her hand scratches out a deep red circle in a piece of paper, gradually revealing the only photo of her father that remains after the conflict. Baumgartner’s “Klassnkameraden” (1999) is a photographic work of three prints that in each one layers images of four children, in fact the artist herself, and refers to Bamgartner’s ambivalent memories of childhood in a historical time and place where individuality was eschewed. Installation view of Christiane Baumgartner’s work, ‘Klassenkamerdan’, 1999, in ‘Conflicted Memory’ at Alan Cristea gallery, London. Image courtesy Kelise Franclemont and Alan Cristea gallery. Esber’s work builds on references to painters such as Jasper Johns, while she refers to flags as deconstructed symbols of national identity. In ‘Conflicted Memory’ the Lebanese artist offers cans of paint containing a colour from some nation’s flag. The wall drawing then is a combination of two colours from the flags of the UK and Mali, chosen by the gallery, and demonstrating her indifference to the importance of flags to represent a country. 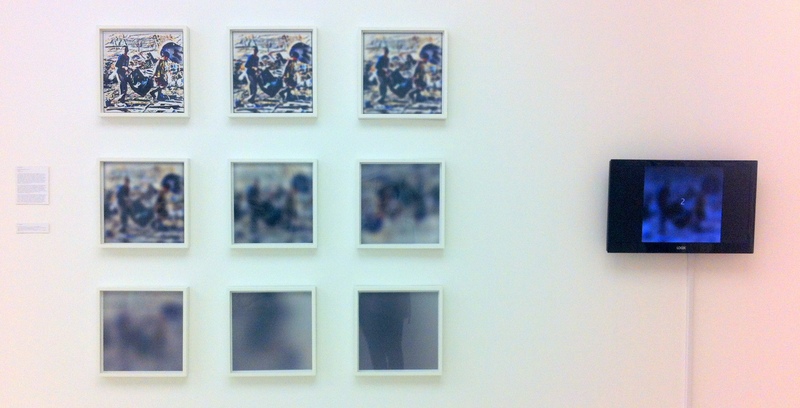 Installation view of ‘Conflicted Memory’ at Alan Cristea gallery, London. May 2013. 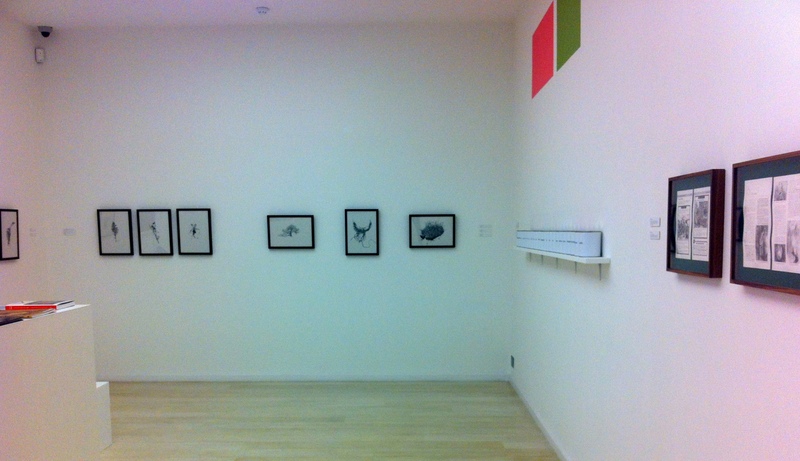 (l-r) work by Miriam de Burca, Ninar Esber and Ruth Goddard. 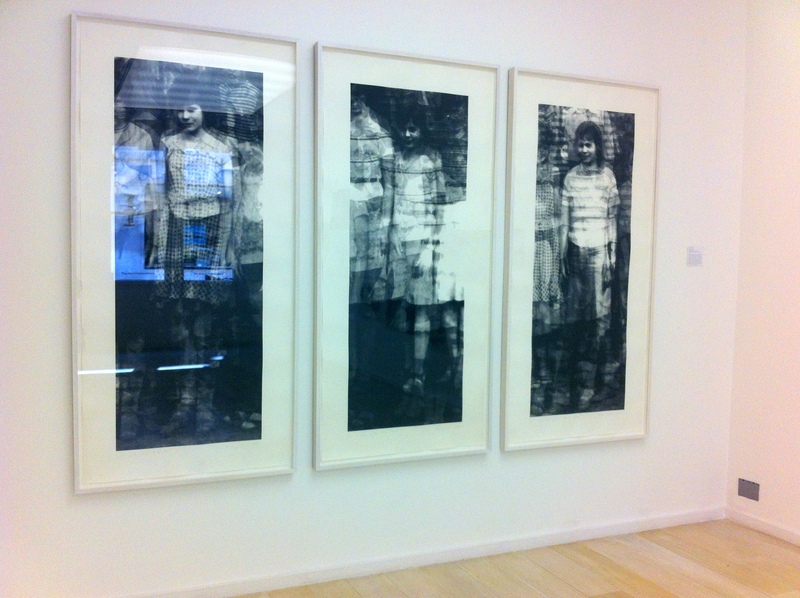 Image courtesy Kelise Franclemont and Alan Cristea gallery. Yoland’s installation of prints and a short video “X-Steps Removed” (2009), refers to the conflict in Gaza 2008-9. Together the images and video keep the viewer at a distance while at the same time, they become a countdown to an impending disaster at the edge of the viewer’s vision. Installation view of K. Yoland’s work, ‘X-Steps Removed’, 2008-9, in ‘Conflicted Memory’ at Alan Cristea gallery, London. Image courtesy Kelise Franclemont and Alan Cristea gallery. Kaabi-Linke’s wall installation, “Stigmata of the Medina of Tunis” (2008) creates a collage of transfer prints taken from writings on the old city wall of Medina, Tunis. The prints are an archive of memories, that may be altered or erased at a moment’s notice. Exhibition details: “Conflicted Memory” at Alan Cristea gallery, 31 Cork St, London W1S 3NU runs from 29 April through 1st June 2013. Free entrance.